Moran is a co-sponsor of Rep. Earl Blumenauer’s (D-OR) Commuter Relief Act, introduced today as a way to bring some equity to different transportation modes. Why should drivers get up to $230 a month to foster oil dependency, greenhouse gas emissions, and congestion when everyone else gets so much less? Transit equity: sets the cap for all transportation benefits at $200 a month – parking and transit. Self-employed extension of transportation benefits: gives self-employed workers transit benefits for their work travel. Parking cash-out: requires employers who offer a parking benefit to also offer the option to take cash instead (reducing the incentive to drive). Van-pool credit: creates a 10 percent tax credit for spending on vanpool services. Bike benefit: raises the cap for the bike benefit from $20 to $40 and makes the procedures easier for employers. It also allows commuters to combine the bike benefit with transit or parking benefits, which they’re now not allowed to do. “What we need to do is to be able to help American commuters break the tyranny of the pump,” Blumenauer said today at a press conference at the Capitol South metro station outside the House of Representatives office buildings. He said the bill would give people choices to reduce their costs of commuting, but reminded his audience that long term, the challenge was to provide better transportation choices. One man standing behind Blumenauer held up a sign with the words “Going to work so I can pay to get to work” in a circle with a slash through it. One of the innovations of Blumenauer’s bill is that it acknowledges that people get to work different ways different days. Under the current law, commuters need to choose a transit, parking, or bicycle benefit. In the new bill, they can mix and match. They can take the $40 bike benefit and also combine it with a $160 transit benefit, up to the $200 total cap. The cash-out option is the key to allowing that kind of flexibility. Rather than forcing commuters into a rigid program of just driving or just taking transit, it can put $200 in their pockets for whatever transportation costs they encounter – whether it’s bus fare, parking, new tubes, or Gatorade for the long ride. The chart above, which parking expert Donald Shoup of UCLA printed on Streetsblog last fall, shows the power that a parking cash-out can have in shifting transportation choices. A recent study by Newsweek* found that one in five employees changed how they commuted when their employer offered a commuter benefit program. Given that a three percent reduction in commuting trips results in a 39 percent decrease in congestion, reducing commuting trips during peak times, through vanpooling or transit, is one of the most efficient and cost effective ways to increase road capacity. Not every automobile commuter gets monetary parking benefits, of course. Yes, in some dense, urban areas like New York or D.C., employers can directly help employees pay for parking in public lots. But in smaller cities and suburban areas, drivers can usually just pull right into the office lot for free. If a commuter wanted to “cash out” that parking benefit under the bill, experts say the IRS requires employers to quantify that in-kind payment to determine how much the cash equivalent would be. 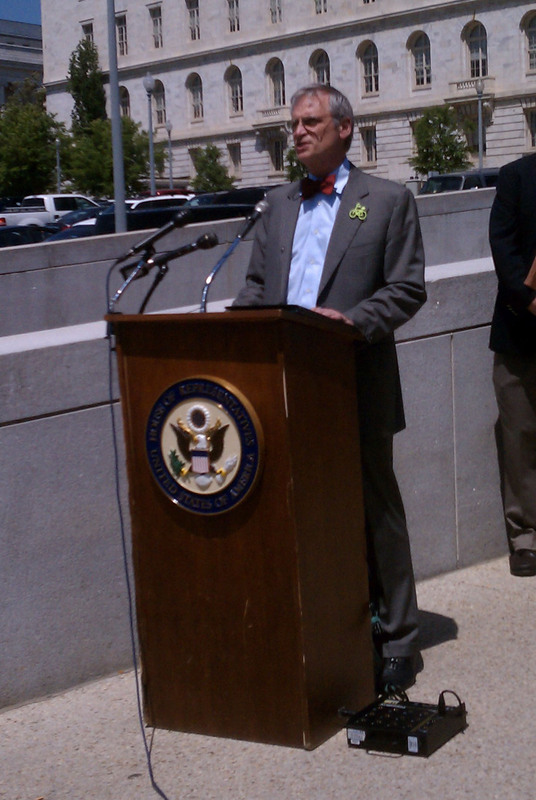 Blumenauer gestured at a massive free parking lot for Capitol employees just behind the House office buildings. * Blumenauer’s office has corrected this: it was actually a BusinessWeek/TransitCenter survey [PDF]. How do I take my transit benefit at the end of the year? I claim a good number of various credits (lifetime learning, making work pay, etc) but I never saw the drive/transpo credit/deducation. nice. This article does not make it clear how parking cash-out would work. It sounds like cash-out only applies to employers who give a parking benefit in the form of cash. Employees can take the cash and keep it instead of taking the cash and using it to pay for parking. Does that mean that employers who provide free parking have the option of giving cash to commuters? If they want to go through the IRS process to determine what the cash equivalent would be, then they can give that cash to non-drivers, but this is completely voluntary? Of course, the vast majority of commuter parking spaces are provided free, so this is an important issue. The right policy would be to require employers who provide free parking to provide an equivalent payment to employees who do not use the parking. This all sounds like waste to me. I bike to work everyday, but that doesn’t mean I want my tax dollars to funding every person that bikes, walks, takes a bus or drives. How about we just stop using tax dollars to fund how people get to work. Isn’t that fair for everyone? I see that those of us who walk to work continue to be nonexistent in the Streetsblog worldview. I don’t understand how this can be policed without wasting resources. What’s to stop people from claiming the highest benefit in any situation? It is more than a waste. Tax breaks disproportionately help those who have the highest salaries. Poor people get little or no benefit. So it is really just welfare for those who least need it. Should just get rid of the entire subsidy. And by the way, I myself get such a subsidy to the tune of about $80/month. Still, I think this wasteful practice should be eliminated. As important as removing bike grease may be for the Cycle Chic, a much more realistic and important expense this Bill would cover is secure bike parking at transit stations. Where someone may be using a car for the “Park and Ride,” with this Bill, the “bike and ride” alternative becomes a lot more attractive. Roughly 9% of my office’s workforce bike some time of the year, and over half cannot participate in the existing bike program because they need to use transit for most of their commute. Opening this connection isn’t just equitable for the 9% I know about, it could open the door to far greater non-automotive commuting. My employer exercises a ‘trust but verify’ approach with random audits. Ultimately, this fringe tax benefit would have to have marginal value for the employer who would administer this, so there could be additional controls or specific configurations the employer could put in place. Also, the $200 cap is already a strong limit. In the SF Bay Area, a five-day-a-week worker can easily near or exceed that limit before you even begin to calculate in bike parking ($40/year). The benefit isn’t supposed to eliminate 100% of the cost, but it can make some of the alternatives to the solo-car more attractive. I know I am about to get flamed for this, but seriously why do we need commuter subsidies in any form? If you choose not to live near your work that is your own problem. I can understand offering some form of need based subsidy in rural areas to lower income working families, but then again they don’t have to deal with fee parking in most rural areas anyway. Operational subsidies to public transportation seem smarter and aren’t open to as much abuse. This whole program in its current form seems like a waste. If you drive a car it costs you money to run it and park it, ride the train it costs the passenger money, ride a bike and the rider pays maintenance, all are expenses of life. I don’t really see why the government needs to be reimbursing me, my employer or any of us for an expense I/we choose to undertake when accepting a specific job. Government — STOP SPENDING MONEY WE DON’T HAVE. Removing all subsidies is the only fair way to go. I agree. While the idea is commendable, the govt. shouldn’t be in the business of subsidizing commutes. 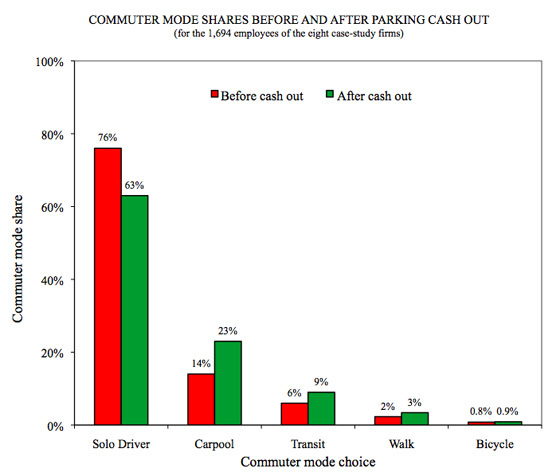 There are natural costs toward the different methods of commuting. Who cares? How often do members of the minority get anything passed in the House? Blumenauer’s plan actually is anti-cycling. Why would he propose giving drivers $200, when someone that just rides their bike across town gets $40? That shows that he feels drivers are 5x more important than someone that chose to live car-lite, live closer to work, and bike. If there is to be a subsidy at all, it should ONLY go to the modes we wish to promote. How about we just drop the subsidy to drivers, and promote cycling, walking, and transit instead. The bike subsidy as it currently stands is ridiculous. It doesn’t work the same way as the transit/driving thing. With transit or driving, the relevant amount is just considered as pre-tax wages. With the biking subsidy, it’s not, so the employer ends up paying an additional $20/mo (untaxed, but still…). They’re entirely different benefits, which tells you a bit about why the biking benefit isn’t something most employers are lining up to offer. They could offer term life insurance, disability insurance, dental insurance or vision for a similar monthly expense. There are laws against fraud. A few years ago there was a sting that netted Fed employees selling their transit checks on ebay. Not sure if anyone went to jail, but there were stiff fines. Think about it: do you want to defraud the IRS?